Sweetwater Plantation is not a fine show place with miles of pristine painted wooden fences, paved drives, and antebellum mansions. Sweetwater Plantation is hard working cattle ranch. Things are kept neat and functional but we stay away from excess for only esthetic value. We do, however, insist upon excess in the performance of our equipment, our personnel, and our cattle. Sweetwater Plantation is located in east central Georgia and currently encompasses a total of 2000 acres with approximately 800 acres in pasture and hayfields with the balance in managed woodlands and wetlands. Hay fields and pastures are established in Tift 44 Bermuda Grass and Coastal Bermuda Grass. When we get our average rainfall of 44.27 inches per year we are able to comfortably manage about 500 cows including the registered Angus, Wagyu and commercial recipient cows. However, the total number of head can be much higher when including the calves, bulls, replacement heifers and steers. We are invested in breeding quality cattle genetics capable of ultimately producing tender and well marbled beef. Our cattle their progeny have to prove themselves worthy or find themselves in the beef pen at the local stockyard regardless of price or pedigree. Today's Sweetwater Plantation derives from an original head-right land grant of three hundred acres to Frank Adkins' great-great-great-great grandfather, Daniel Adkins in 1770. The plantation became a tract of a few thousand acres by the mid-1800's under ownership of Daniel's son, and Frank's great-great-great grandfather, Reverend Aaron Adkins. It was a self sustaining farm which prospered in the production of food crops, cotton, and livestock. With the coming of the civil war and then reconstruction, the once large estate was eventually broken up through inheritance and the sale of the property into several smaller tracts. Frank feels fortunate in being able to get back a large piece of his family's history with his purchase of Sweetwater and is dedicated to continuing agricultural practices on the property. Sweetwater Plantation has had a rich and diverse agricultural past having been a producer of cotton, tobacco, food crops and, of course, cattle. On February 1, 1993 Frank purchased the property from the Van Rautenkranz family who had been pioneers in the establishment of Limousine cattle in this country. Frank changed production to a commercial cow/calf operation using Limousine bulls. In 1996 under new management of John Gillis the limousine were ushered out and replaced with Angus bulls which delivered higher quality and more profitable calf crops than the previous bulls. 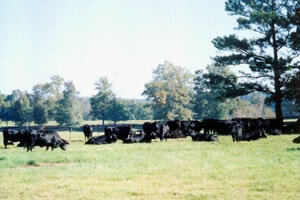 Our Registered Angus herd was started in 1997 with top preforming cattle from all over the USA. We expanded and improved upon these foundation cows with artificial insemination and embryo transfer. In 2002 we began cross breeding a few Angus cows AI with Wagyu bulls and the resulting beef was of outstanding quality. In 2006 and 2007 we acquired our first full blood Wagyu cattle and placed them into our embryo transfer program to help supply the growing demand for genetics that produce the finest beef. In 2009 we became a certified Georgia Grown producer and established our certified Wagyu branded beef program with the Sweetwater Plantation Wagyu - American Style Kobe Beef Private Label.